Whilst Good Friday and the fish-fest is over, it served to remind me that I was yet to bring you my review of George’s. It hardly had a low key opening and has proved a popular addition to the city centre. In fact prior to this visit I attempted to go at 1900 on a weeknight and couldn’t get a table for 2. The interior is really attractive, downstairs is stripped back with brickwork and tiling whereas upstairs runs the booth/beach hut theme. The place seems to have maintained its level of interest as it was packed when I eventually visited in early March. The menu was presented as a newspaper, which was a nice thought, though it was a little unwieldy. It was also larger than I expected steak, pies and burgers as well as the obvious fish choices. If you aren’t offering a burger these days, how could anyone take you seriously….right? 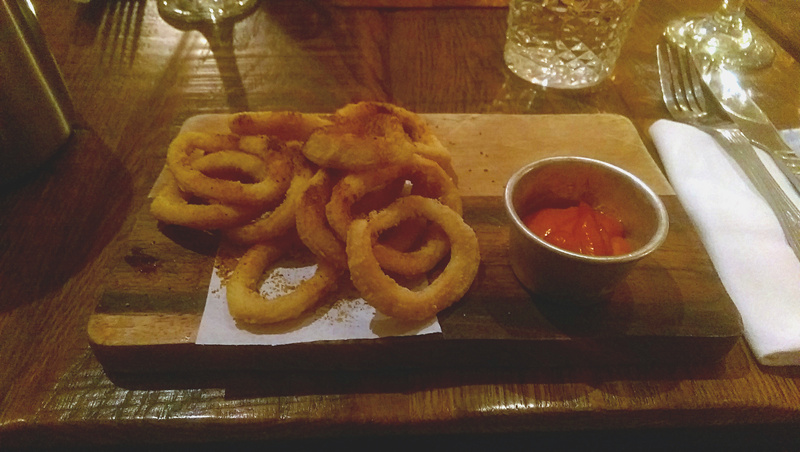 Starters were a little limited in options, I went for the calamari, a trusty favourite. The plate police would be out in force here, though the unnecessary board was probably the most exciting thing about the dish. The squid itself was a little overcooked though a little seasoning on the breaded rings did add a nice bit of something different. The aioli was also pepped up, but it was little better than a standard version. Between courses let me have a rant. In a restaurant that reminds you at every moment that it is “Proper British”, their vegetable of choice all year round appears to be asparagus. Picking such a seasonal vegetable seems odd as it’s almost certainly imported from a far off land. Frustrating to someone like me but probably barely noteworthy to everyone else! For a main course I decided on a steak burger. Only joking. Battered cod with chips and mushy peas were, of course, the choice. The long, crisp, golden fillet was simply presented and attractive for it. I was impressed with the quality of the cod, the batter crunchy and greaseless. I have a controversial chip preference, I like them soggy. I couldn’t have hoped for these to meet my tastes I know, but the consensus from my friends was pretty positive. Mushy peas & tartare were ok too but certainly nothing special. Possibly the most exciting element were the pickles, it doesn’t state whether they were homemade, but were definitely a level above anything I’ve had from a jar. 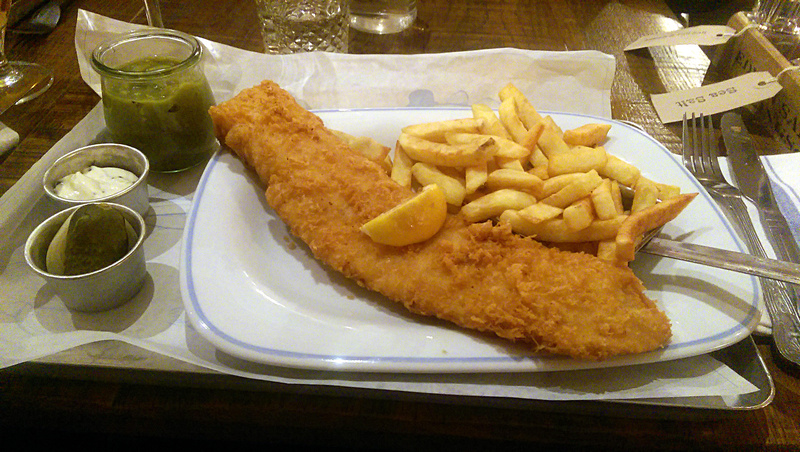 Overall the meal at George’s was pretty enjoyable and I couldn’t have asked for too much more from my fish and chips. They were almost as good as the Cod’s Scallops (still my favourite), but not quite. What I haven’t mentioned to this point is price, the calamari was £5.45, the cod £11.45. I wouldn’t say this was unreasonable for what I ate. I do feel though that this British staple shouldn’t be an expensive meal. I guess it’s the city centre premium but I couldn’t help feeling it was a couple of pounds too much. It was a very good meal. Although the temp of the food was rather low. So when I had reached the end of the meal it was almost cold the onion Bagji batter was great but I would have had it in a whole fish not as the menu days. And payed for curry sauce. The tartare sauce is missing the lemon acid finish. Needed to cut through the fish batter or crumb. Staff are attentive. And even was good.